What is your favorite dressing? Mine must be Japanese sesame dressing (胡麻和え - goma ae). This super easy dressing makes the most humble greens shine through. I make this dressing all the time and pair it everything from spinach, broccoli, watercress, yu choi, and of course, broccolini. 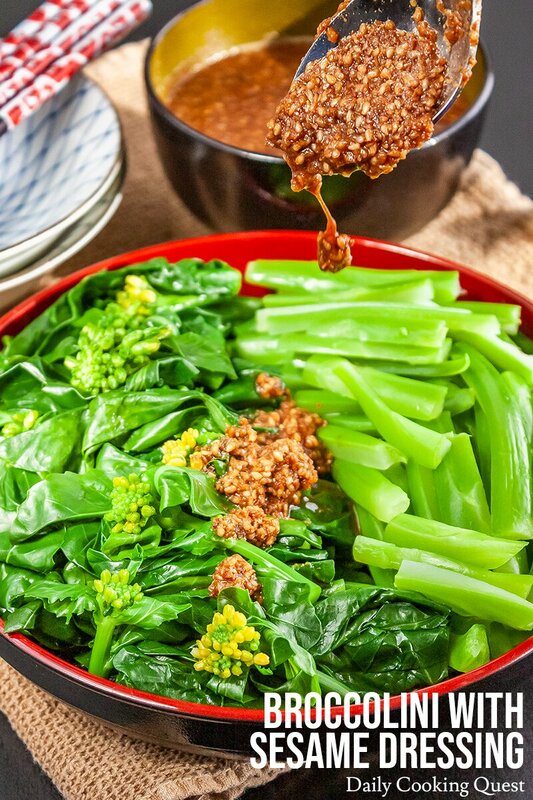 Despite this broccolini sesame dressing recipe uses broccolini, feel free to pair this lovely goma ae with all sort of greens. The amount of dressing works for any one pound of vegetables. 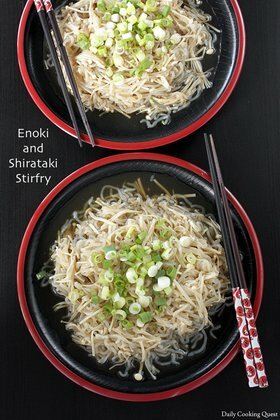 You will need 1⁄2 cup toasted sesame seeds, 1⁄4 cup soy sauce, 2 tablespoon sugar, and 100 ml (6 tablespoon + 1 teaspoon) dashi stock. Don’t worry if you cannot find sesame seeds that are pre-roasted. You can easily toast them on a frying pan (as is, without any oil) over medium heat until fragrant and golden brown. I have a slight intolerant to peanuts and all sort of nuts, so this sesame dressing is a God send to me :) It is super nutty just like nuts, but completely nut-free! Most of the times, broccolini comes with green tops and stalk bottoms. It is best if you can separate the greens from the stalks. I usually half or even quarter the stalks depending on how thick they are. Not much needs to be done to the broccolini. Just boil a large pot of lightly salted water, then blanch for 2 minutes. To retain the lovely green color of your vegetables, you must rinse in ample cold water and even soak in a large mixing bowl of cold water with ice cubes. Once completely cool, gently squeeze and cut into bite sizes. 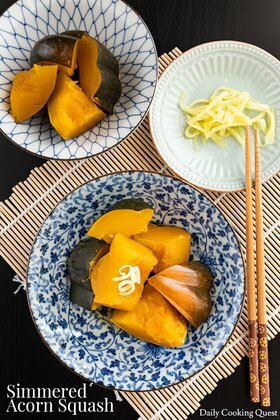 Arrange the vegetables in a nice platter, and serve with the goma-ae. Separate the green part of the broccolini from the bottom stalks. If the stalk is not too thick, half them lengthwise. If the stalk is rather thick, quarter them lengthwise. Wash and drain the greens and the stalks. Bring a large pot of lightly salted water to a rolling boil. Add in the greens and the stalks, blanch for 2 minutes. Remove the greens first, if the stalks seems tough, feel free to cook for another 2 minutes. Rinse the greens and stalks in cold water, and soak in a large mixing bowl filled with ice cubes and cold water for 10 minutes. Gently squeeze the vegetables and cut into bite size pieces. Arrange in a plate. 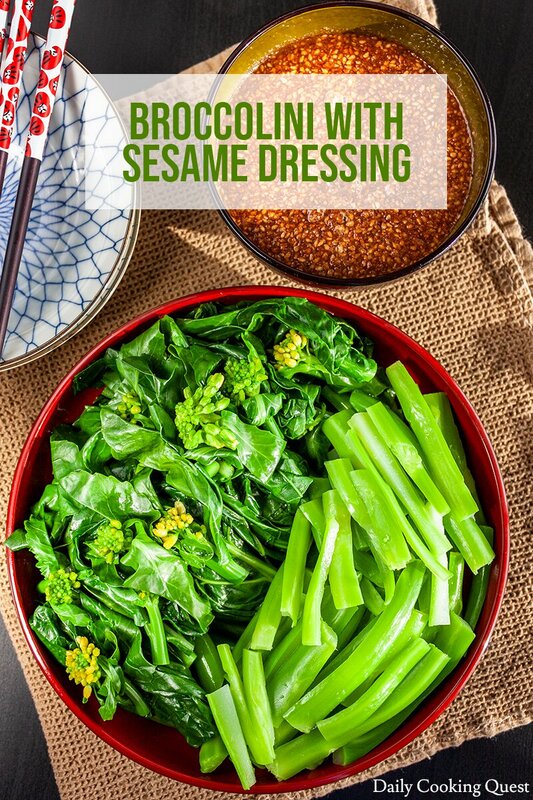 To make the dressing, coarsely grind toasted sesame seeds. Transfer to a bowl and mix with soy sauce, sugar, and dashi stock. Such a simple yet beautiful and delicious side dish. That sesame dressing though!!! Gotta try it! I loooooove broccolini and I get a giant bag from Costco and eat it within a few days. That dressing sounds amazing and I know I'll enjoy this recipe! Haha, I too get my veggies in giant bags from Costco, and still they disappear so quickly around here. Yes! I love broccoli, and I love sesame seeds... this is like the ultimate way to enjoy them! Definitely going to give this a go. This is the most delightful sesame dressing so thick and delicious. This would be a fantastic side dish for so many of our meals. 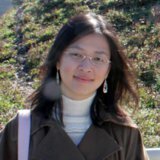 Thank you for the inspirations. Yup, it's such a versatile dressing. And when you are bored with greens, the dressing pairs really well with tofu too! Never thought to use dashi in a dressing! Woah! That's amazing! Will make some extra dashi when I make ramen next time! I always pack brocolini for lunch and drizzles with my store-brought salad dressing. I can't wait to try it with your sesame dressing. What a beautiful and healthy looking dish! Yum! 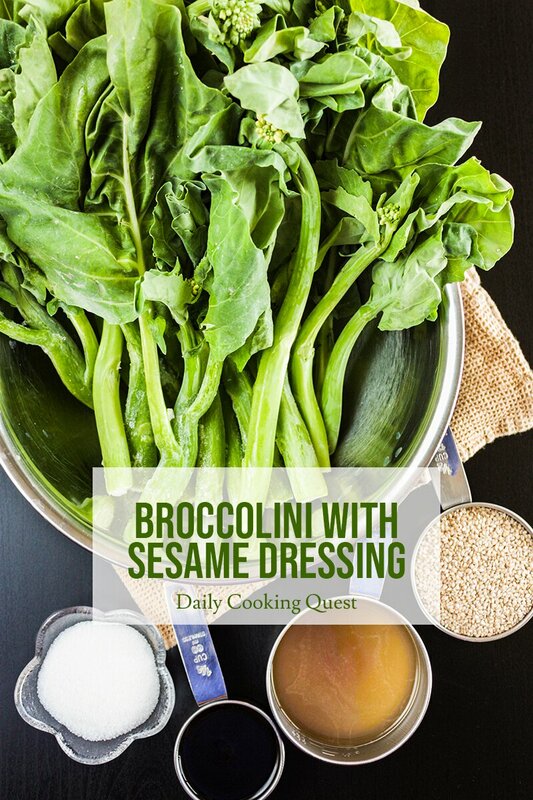 I love broccolini and I can't wait to try this sesame dressing with it. It sounds perfect for a side dish for a weeknight dinner! Same here Shihoko :) I think I have tried it on all sort of veggies, even cauliflower, broccoli, and kale, haha. I have to try this! Looks like a great dish! Your veggie dish looks so delicious, I love anything with a sesame dressing.